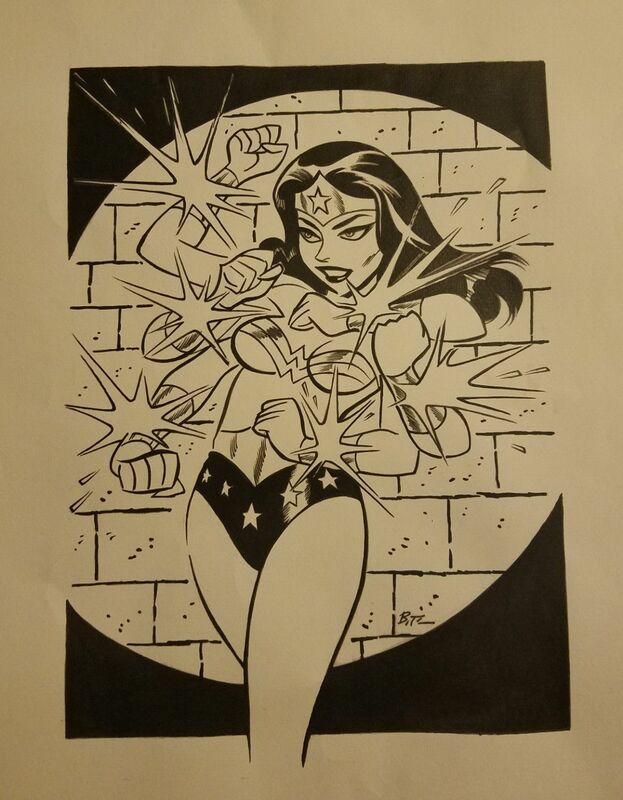 The true owner of the authentic piece is Gregory Tigges, and he has it currently displayed on his ComicArtFans gallery. I contacted Greg and he also agrees the Ebay auction item is a copy. Both Greg and I have reported the item to Ebay, but it has not been taken down. After Ebay contacted the seller, the seller updated the post to say that, "it is a 100% ink drawing". Maybe I have better eyes than most, but in the magnified image on Ebay, I can see the vertical toner lines that come with a printed copy. Notice the seller has not posted any pics of the backside of the drawing; the real piece would show ink bleed-thru on the back. I report it to EBay. Thanks for the support everyone and a job well done!. I'm sure the sheer volume of reports from you all, finally convinced Ebay to take it down. Given the popularity of the piece (there were a lot of people watching that item), I was really worried the winning bidder was going to be out a good chunk of change. What really surprised me about all this is that Gregory won the auction for the true piece a couple of months earlier on Ebay. The results of that auction are still visible under the Sold results on Ebay. So both the seller and the bidders could have easily searched that beforehand. Well, that didn't take long. The seller has reposted the Ebay auction and it is active. I tried to help out unsuspecting bidders, but I'm done. I leave it to the potential bidders to fend for themselves. At least we tried to make a difference. 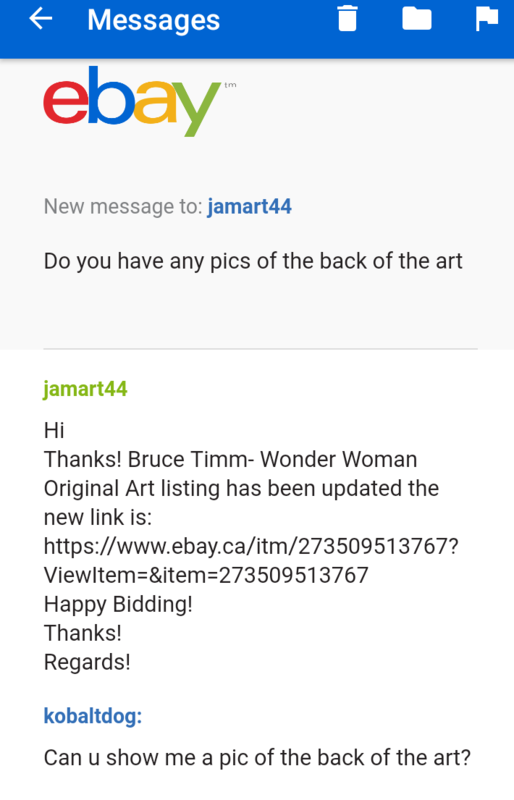 I'm not making any judgement towards the seller as maybe he does truly believe it is an original piece. What I will say is that the seller states the item condition is "perfect conditions, mint like new", yet anyone can clearly see the 'finger dents' on the paper. Isn't that already kind of a red flag right there for any bidder? Well, that didn't take long. The seller has reposted the Ebay auction and it is active. I tried to help out unsuspecting bidders, but I'm done. I leave it to the potential bidders to fend for themselves. At least we tried to make a difference. I'm not making any judgement towards the seller as maybe he does truly believe it is an original piece. By bidding on items bidders understand and accept that: items are represented to the best of my ability, may be used or aged, and may contain unseen faults which are not listed and for which I do not take responsibility. I do not authenticate nor claim to be experts in the field of items listed; I use my best ability to determine the item and characteristics of the items attributes and functions. Please contact us prior to bidding to clarify any questions or concerns. If the item is not determine with any authentication it means it is sold as is,in the manner or attributed to, the artist. Glad I seen this , I had bid on it and thought about bidding again. This piece was mine and then I sold it on eBay. I sold it to Tigges. To my knowledge, Timm does a B&W version and then a colored version for each character. As stated earlier, this is not real. I have a pic of the back. You’re not going to see it from him. Stay away. Kudos to Ebay user 'superboylives' for stepping-up and posting a competing Ebay auction, to warn bidders of the FAKE. It's starting to get down to crunch time. Let's hope bidders see it before the FAKE goes into frenzied bidding mode. And 'superboylives' so correctly pointed out that the FAKE has the lasso deliberately removed. You can see how the star (second from the left) on her shorts is only a half star because that's where the lasso was. @munster: Glad we could help. @KobaltDog: I too asked the seller for a picture of the back during his initial attempt. No reply from him/her. @Dayzen: Thanks for providing even more evidence. I originally posted a warning also on CAF, but deleted it when the initial Ebay attempt was taken down. I haven't re-posted a warning on CAF because Tigges' piece is there for everyone to see anyways (which 'superboylives' also noted in his ad). There seems to be other BT art on the bay that is questionable. Does he do somewhat "Racey" commissions? Seeing more of those lately. for a while there I thought all he was drawing were the nudes! At least it's over. Thanks to all for spreading the word and the support. The $$$ damage could have been much worse for the successful bidder. Now I understand why many on this forum are not fans of Ebay.